Product #21790 | SKU DV-GP3-XT60 | 0.0 (no ratings yet) Thanks for your rating! 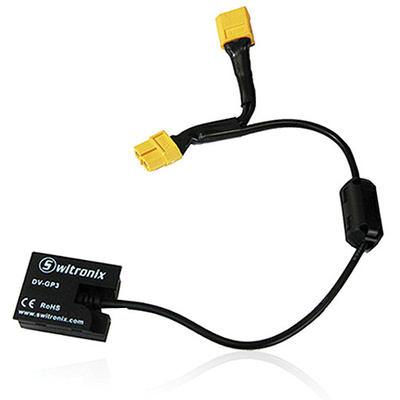 The GoPro Regulator Cable Y with XT60 Connectors from Switronix allows you to power a GoPro HERO3 or HERO3+ from a Quadcopter or Hexcopter battery. This allows you to have a single, unified powering solution for your aerial system, rather than having to rely on a separate GoPro battery that may die at a different time than battery powering the aircraft. The GoPro Regulator Cable Y features a DC coupler that slots into the battery compartment of the GoPro, lock securely in place unlike solutions that rely on the USB port to supply power. In addition to the naked camera, it can be used with the Skeleton Housing, or even the Underwater housing if the Skeleton back door is used. Note that the Underwater Housing will not be fully watertight in this configuration, but may provide additional water resistance beyond the full Skeleton Housing.